The process of building wooden furniture has numerous steps, many of which have little to do with the actual construction. A large aspect of the assembling chairs, tables, kitchen cabinets and several similar items is the finishing stage, which is a multi-phase procedure that includes multiple spraying and sanding steps. Next to overall style, the finish – stain or paint – is the most highly visible criteria of a potential consumer. 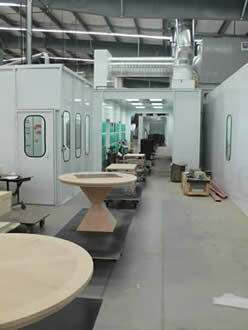 For one furniture manufacturer, the finishing stage of their process was causing a bottleneck in their process. Having only one spray booth, workers were continually moving chairs, tables, desks and dresser units in and out of the single booth on manual push carts. With their high quality, four-coat stain finish, furniture pieces had to be stored around the plant for curing between coats and intermediate sanding steps. With all the shuffling of carts, valuable time and floor space were not used efficiently and it was difficult to keep track of all the partially stained furniture staged around the building. Furniture pieces could be cut, milled, assembled and sanded at a higher rate than they could be stained, resulting in lowered production rates. Because the furniture varied greatly in size and weight (from 5 lbs. – 200 lbs. ), many items were cumbersome to move manually through the various finishing processes. To create a viable solution, the furniture manufacturer would require additional spray booths in the plant; no system could run effectively with just a single booth present. PACLINE worked with a spray booth company, who would supply the additional booths and flash off (curing) tunnels. PACLINE provided a customized PAC-TRAK™ Towline conveyor system which would allow floor workers to be freed up from shuffling carts and tracking storage locations of partially finished pieces of furniture. A 430 ft on-floor cart line with 75 carts was conceived and created to transport furniture through the multiple spray booths with close-packed accumulation in between, allowing every item to flow through each step of the finishing process in a consistent, timely manner. New carts were created, with the bottom portion mated to the on-floor conveyor and rotating rectangular top platen, allowing the top platen to be automatically rotated in close-pack accumulation areas or manually in the spray booths. The system also allowed for variable speed operation to accommodate both simple and complex items. At the maximum 9 FPM set point, raw pieces could be completely finished in only 83 minutes. PACLINE performed a complete mechanical and electrical installation of their PAC-TRAK™ Towline Conveyor – complete with in-floor drive pit and carts – and seamlessly integrated it with the booth supplier’s equipment. The very next day the customer was able to train their staff and run afternoon production – seeing positive results and a sound return on their investment. The finishing bottleneck was completely eliminated and throughput through this process increased by 400%, without an increase in the number of staff. This, combined with the reduction in finishing costs, meant PACLINE’s solution helped the customer save time and money while increasing the overall plant production rate.